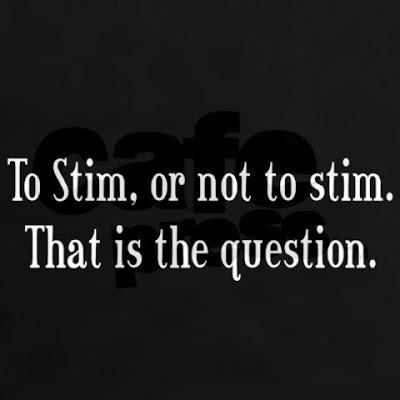 To Stim, or Not To Stim; THAT is the Question...... - I Love ABA! To be or not to be? No, actually a very popular question I get asked is: "To stim, or not to stim??" Sterotypy, aka "Stimming" (see my Glossary for an explanation why the term "self-stimulatory behavior" is misleading, and ABA professionals use stereotypy instead), can take many forms and can be quite frustrating and confusing to parents and caregivers. These repetitive behaviors can be very enjoyable and automatically reinforcing to the individual doing them, absolutely. However, for the parents, teachers, or caregivers trying to move these children through a busy day full of activities and transitions, stimming can slow that process down, or bring it to screeching halt. From a teaching perspective, when children engage in sterotypy they may seem to completely shut out the outside world and may not respond to demands, instructions, or even touch. Some of my clients will engage in loud vocal sterotypy in group or classroom settings ("AHHHHHHH - HHHHHHHH! "), that makes it near impossible for other children to focus or learn. I often will think to myself "Oh, you just went on vacation didn't you?" when one of my clients starts engaging in repetitive behaviors and trying to tune me out during therapy. Not all individuals on the ASD spectrum have repetitive behavior to the degree that it interferes with learning or social interactions. That must be said. However, many do, and for those that do it can sometimes be a pretty significant issue. Many parents feel they don't want their child to "stim" at all. Other parents feel they want their child to know when to engage in sterotypy and when not to, and for some of the families I consult with this isn't even an issue (they do not want sterotypy reduced in any way). Just imagine that your way of de-stressing after a long day is to have a warm bath and listen to music and everyday a therapist stops you right as you go to turn on the bathtub faucet and says "No. Hands Down". How would you react to that?? I don't recommend simply removing a behavior. You must remember, there is a function (need) involved. It would be better to teach a replacement behavior that is less disruptive and does not prevent learning/social interaction. 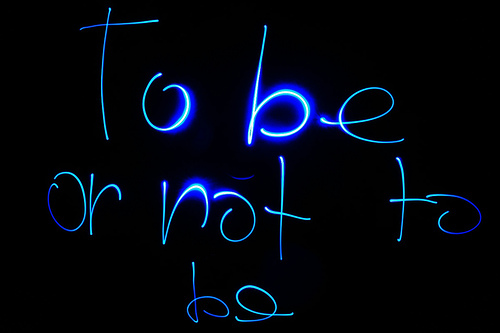 To put it simply, teach the child what TO do instead of just focusing on what you DON'T want them to do. Consider redirection, Differential Reinforcement, or teaching toy play/hobbies. I understand sterotypy can be very trying on a parent and also difficult to handle in public. A large step towards viewing "stims" as commonplace and not an annoying habit to extinguish is to realize that everybody engages in repetitive behaviors! Really, they do. The next time you are standing in line at the bank, or waiting at a stoplight, look at the people around you. Do you see someone twirling their hair? (I do that one). Do you see someone tapping their foot? What about humming to themselves? So if you and I engage in repetitive behaviors at times, then what is the difference between that and your child engaging in repetitive behavior? Well usually, it is the frequency/intensity (especially if the behavior causes harm), and the inability to interact/learn/engage in any other activity while the sterotypy is occurring. THAT is the difference. "I enjoyed your post on stimming. I like so much how you tell how everyone does it, and the analogy of a neurotypical person not being allowed a hot bath at the end of the day. Not being allowed to stim would sometimes be very much like this. Other times, it would be more like not being allowed to smile when I am happy. It's interesting to hear a neurotypical perspective: when we stim you feel we're in our own world. This is sometimes true....sometimes stimming helps me concentrate. Actually, stimming almost always helps me concentrate, just not always on the thing I am supposed to be concentrating on! :) When I spin around and flap, though, I don't feel like I'm in my own world. I feel like the I am surrounded by the world, held by the world, and my hands are moved up and down by what is the rhythm, the essence of the world. I stim to get the magical feeling of connection you might feel in the redwoods. True, this does sometimes require less being-with-people, but the world is just so magical and so wonderful and whole that- I don't know. As a spur of the moment choice, and as a conscious choice, I think my limited time is better spent spinning than small-talking. Stimming is also catharsis. You're right, it can be used when bored...... and it is a wonderful way to order the world in the midst of sensory overload." I am waiting to be interviewed for an ABA therapist position and your posts are so helpful and informative. I feel I will go into my interview more confident! Well thank you, and good luck on your interview!